We are very proud of our recent website for landscape design company Paul Massad Landscaping. The site has some of the best graphics we’ve ever gotten a chance to use, their work is amazing, and that helps a lot. The homepage features a large image slider featuring some of the their finest works. There is also a rotating quote widget thanks to the Flexi Quote rotator plugin for WordPress. For the first time ever we worked heavily with the Google Maps API to create a custom project map. While retaining all the functionality of your standard Google Map, we add job indicators in the form of a tiny shovel to create ‘hotspots’. 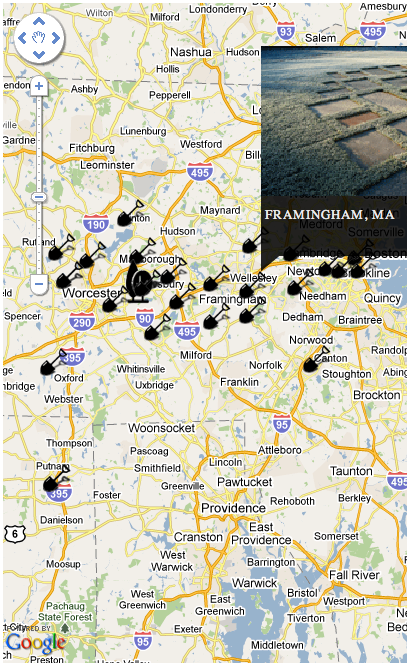 When you move the cursor over these hotspots you get a job preview with a picture and a link (to come). This type of integration can be custom tailored to any number of different applications. If you would like to see what we can do for your website contact us here.